Everyone wants to have fun playing colours with friends & family but there is always doubt in mind about quality of artificial colours . These colours can cause irritation, allergies & chemicals they have in them are both dangerous for skin and for health . Many times it has happened that accidentally we swallow colours or we had hard time to get rid of few colours from the skin. Kids are always excited & we can’t keep watch on them all the time. These are easy DIY Homemade Holi Colours. These are super duper easy with very available ingredients at home only. I have prepared both dry & water colours. I prepared powder & kept it outside in sun rays only for 2-3 hrs . For main base , you can use Corn flour, White flour(Maida), wheat flour ,gram flour(besan) , or talcum powder. Here I used corn flour as other flours holds water & get sticky. Fine semolina (fine rawa ) is optional but can be added to give little rough texture as all flours are very smooth. Pink– Boil beetroot in water for 10-15mins(more if you want darker shade). Add this little water in corn flour along with 1/2 tbsp of semolina(barik rawa) . Mix it properly so that colour spread finely. Don’t add too much water otherwise lump will form. You can add various food colours to get different shades. Please use branded food colouring . Prepare this coloured mixture by boiling water with ingredients. Keep this water in air tight container along with ingredients for 1-2 days so that nice deeper shade is infused into water. Keep it in refrigerator as they get spoiled soon. When you want to play first strain this liquid then mix with plain water . Orange Colour– Boil orange skin in water for 10-15mins(or more) add few saffron strands too. Or add pinch of sandalwood powder. Dark Purple- Boil beetroot slices in water for 10-15mins store this water along with slices in a jar. Yellow– Add turmeric roots in hot water. Red– By adding pomegranate juice or red food colour or vermilion. Green– Boil spinach leaves for 1-2 mins add cold water immediately so it will retain its colour, grind it & mix it with little water. But please be careful with your kid’s eyes . Happy & Safe Holi! Enjoy this festival with lots of dazzling colours😍 . 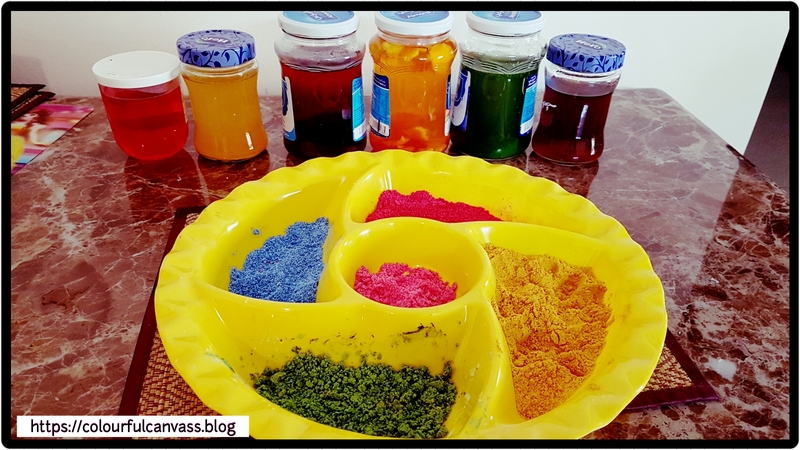 Hope you find this post useful & share your ideas for new natural holi colours also. Disclaimer : I tried this home made colours for the first time. So not sure about how long & dark it will stay. 😷 Just don’t worry if colours don’t come out as expected……. Thanks Divya. You’re really sweet 💕. Wishing you the same to you & your family. Kudos to both Mom and daughter for making organic colours at home. Appreciate your efforts in doing that👏. A very happy Holi to you and your family Bhavana! Thanks Radhika….yeah we managed to finish this post yesterday so that if anyone wants to try it, atleast 1day is there to settle down colours . I’m pleased to know you liked it. Thanks Shikha💕💕 Enjoy festival of colours. Well done Bhavana! What a wonderful and healthy way to celebrate Holi! A very creative DIY project indeed! Happy festivities to you! and family! Oh my god this is something really wonderful I’ve got to do. I’ll for sure try to make them. Hey! and if we swallow these colours then also no fatal harm as such. Right? Because all are edible products except the talcum. And how easily they will be removed. Clap! Clap! your efforts did bore the fruit. Dear Shreya , your comments always bring a big smile on my face. Yes dear, colours are safe but if you swallow in large quantity might be a problem😜😜. Hahaa! thank you. ::) Pleasure all mine. We won’t definetly eat them in huge quantities but was just conforming like while washing face it sometimes enters a little bit. Yeah so right …. sometimes worry leads to creativity. Wonderful post. Playing holi with herbal colors is always safe. Thanks for sharing. Wow!! Will try it… Happy Holi!! Hi, I have nominated you for the Liebster award. Congratulations. You can check the details here. Helpful suggestions, I’ll try it out next time. Love this!! Learned about Holi and celebrated it for the first time last year. Such a great post and happy spring! wow! that’s great . Glad to know you found this post helpful! wow!!! this is amazing …following you for more…this is my blog https://creativehues01.wordpress.com/ if you are interested..
Sure I’ll check it out. It’s ok Gauri…next year. …Thanks for stopping by. It’s Gaurvi. Hahaha, most people get it wrong.